The Rosetta Project is a global collaboration of language specialists and native speakers working to build a publicly accessible digital library of human languages. The Rosetta Disk fits in the palm of your hand, yet it contains over 13,000 pages of information on over 1,500 human languages. The pages are microscopically etched and then electroformed in solid nickel, a process that raises the text very slightly - about 100 nanometers - off of the surface of the disk. Each page is only 400 microns across - about the width of 5 human hairs - and can be read through a microscope at 650X as clearly as you would from print in a book. Individual pages are visible at a much lower magnification of 100X. The outer ring of text reads "Languages of the World" in eight major world languages. We have now engineered a special numbered edition of the Rosetta Disk, shown in the image below, that can be yours as a gift for joining The Long Now Foundation as a Lifetime Member. Proceeds support the Rosetta Project and our work to build the largest open, publicly accessible collection of resources on the world's languages. The graphic below is an interactive version of the Rosetta Disk that gives you an idea what it is like to browse the contents of an actual Rosetta Disk through a microscope. This interactive version shows the first prototype design of the Rosetta Disk which has two sides (our new design is single-sided). You can click on "Front" to zoom in on the spiral-text side shown below. Click on "Back" to zoom in and browse the contents of the archive side, with its 13,000 pages of language documentation. Some users have experienced issues viewing the interactive disk. If this includes you, please make sure you're using a modern version of your web browser. Mozilla Firefox or Google Chrome have been verified to work (Windows, Mac and Linux platforms). 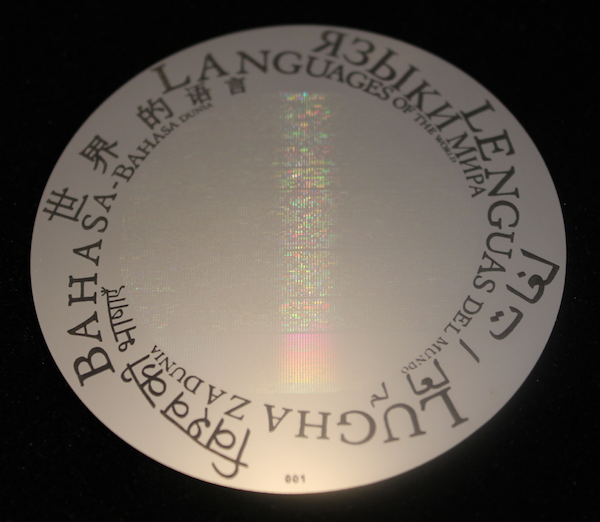 Long Now project PanLex is collecting vocabulary for all the world's languages. Rosetta ESA Mission lands on Comet 67P with a Rosetta Disk on board. The Rosetta Project collection is available at the Internet Archive.